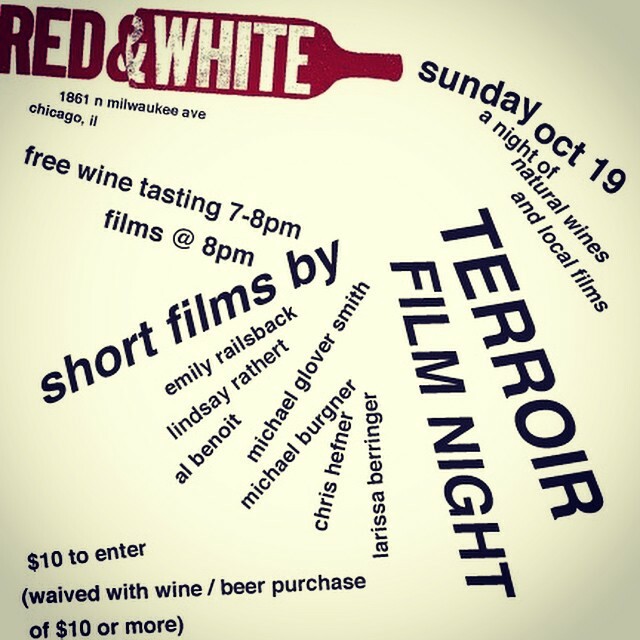 My short film The Catastrophe, winner of the Best Dramatic Short at the Illinois International Film Festival in 2011, will be screening this Sunday night at the Red & White Wine Shop’s “Terroir Film Night.” Advertised as a “night of natural wines and local films,” this adventurous program curated by Emily Railsback will feature short “dark-themed” works by local filmmakers including Al Benoit, Larissa Berringer, Chris Hefner, Mark Winters, Railsback and yours truly. Admission is $10. Or buy a bottle of wine / beer ($10 or more) to waive the entry fee. This includes a free Free Wine Tasting from 7 – 8pm and film screenings at 8pm.